Welcome to yukonplacesandnames.com and thank you for visiting our site. 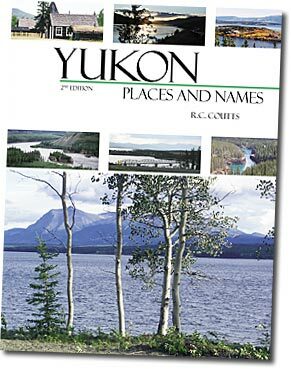 Yukon Places and Names is an excellent source of information on Yukon place names and presents fascinating accounts of their history and the people behind the names. It is a reference book, a travel guide and a joy for the armchair explorer. In this newly expanded edition, Bob Coutts has added yet more stories that literally cover the map of this storied region. We hope you will take the opportunity to post messages on our forum and give us feedback about the book. Eventually, all additions and changes will be incorporated into the next edition of Yukon Places and Names. For any country, its names are a part of its history. From the beginning they have been a necessity; they are the means by which inhabitants and particularly explorers tell others where they have been and what they have seen. Indeed, without names, maps, records and books would be unintelligible. When we see names in books or on maps we often take these for granted, thoughtless of asking ourselves whence they came or whether there is a meaningful story in their origin, but if we are curious where do we find out? Heretofore, there has been no handy reference for this information on names in the Yukon Territory which with its growth of population and expanding development, badly needs a published record of the history of its names. In YUKON PLACES and NAMES, Robert C. Coutts gives us a book which fills this need admirably. For him, its compilation has been a labour of love, occupying years of research through old manuscripts, maps, books and all sorts of sources of information including mining records and private diaries. This work has taken him to many parts of Canada and to the United States in his hunt for original sources of names. From this he has produced a convenient alphabetical list of Yukon names, giving the features they apply to, their locations and historical background. In many instances this includes tales of the men who discovered the features, how they chose the names and who or what the names commemorate, in addition to accounts of those whose names the features bear. The author gives historical accounts not only of the well-known, established names in common usage but also of lonely creeks and hills, and long-abandoned localities in the hinterlands rarely now remembered, whose stories fade with passing years. Besides supplying the history of these out-of-the-way places, this volume will make a most useful contribution to resurrecting these old names. When new strikes are made on old ground, where the early names were in obscure records and generally unknown, newcomers are prone to introduce new names. Here is a bulwark against such errors. Throughout its length the book by its very nature supplies a store of historical notes and fills an important place among the historical references for the Yukon Territory. Five years of experience as representative for the Yukon Territory on the Canadian Board on Geographical Names gave me a very real appreciation of the need for such a work as this book and it gives me great satisfaction that this need has now been so well filled. The author points out that a number of names have been omitted for lack of information and almost daily we see new names established. It is my earnest hope that as time goes on, revised editions, in the same style but containing the missing names and giving the new ones, will follow, keeping the record up to date.